White Clover (Trifolium Repens) other names : Dutch Clover , White Clover. White clover (botanical name Trifolium repens) is a clover species that is indigenous to Europe, West Asia and Northern regions of Africa. Extensively introduced across the globe, this species is cultivated in the form of a pasture crop and is currently even common in the grassland regions in North America as well as New Zealand. White clover is also known as Dutch clover, as this species was cultivated in Holland for the first time. White clover is an herbaceous (herb-like) perennially growing small plant. White clover grows close to the ground and produces small whitish flower heads, which usually have a pink or creamy tinge, which may occur as the plant matures. Usually, the flower heads measure anything between 1.5 cm and 2.0 cm (0.6 inch and 0.8 inch) wide and appear at the end of the flower stalks or peduncles measuring about 7 cm or 2.8 inches. 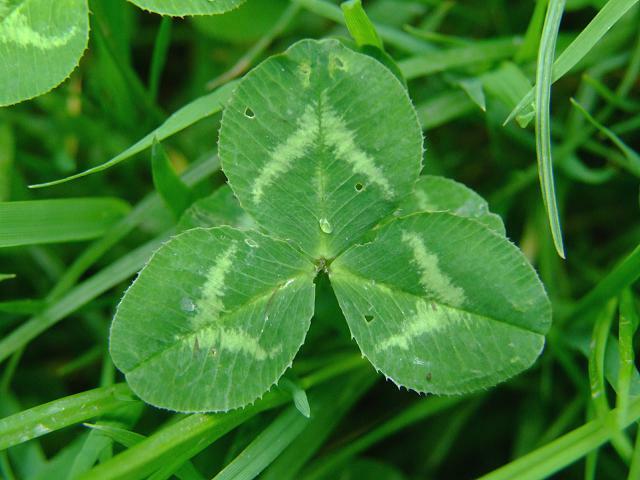 The leaves of white clover naturally appear in the shape of a symbol called shamrock. The leaves are smooth, trifoliate (having three-lobed leaves), and having elongated petioles and they may be elliptical to oval or egg-shaped. The stems of white clover perform the function of stolons and, hence, often white clover forms mats on the ground - their stems crawling about 18 cm (7.1 inches) in just one year. Like other stolons, the stems of white clover develop roots at their nodes. The flowers of white clover are loaded with honey, which is easily accessible to the common honey bee. Hence, beekeepers value this herb greatly. This species is a very well-known weed that has been naturalized in nearly all places across the globe having temperate climatic conditions. It is an herbaceous plant having expansive stems, much akin to the stolons. The white clover produces numerous whitish or pink-hued blossoms in the flower heads. A perennially growing species, white clover is pollinated by insects and are necessarily an out crosser. The species also propagates vegetatively by means of its stolons, which develop roots at the nodes. Similar to other plants belonging to the legume family or Fabaceae, white clover also hosts microbes in its root system. These microbes possess nitrogen fixing abilities, whereby nitrogen present in the atmosphere is converted into a form that can be used by the plants for their nutrition. Sometimes, white clover plant produces a leaf having four (or even more) leaflets and, hence, is also known as a "four-leafed clover". There are a few myths attached to this herbaceous plant. One such story goes like this - sorceresses collected Trifolium repens during a full moon night and blended it with vervain, in addition to other things, while young girls in pursuit of a symbol of ideal bliss, searched for the white clover during the day. White clover is found growing naturally in grassy lands, crops and various other types of landscapes. In addition, this species is also found confined variety of dissimilar field type locations. This clover species has the ability to endure close mowing and can thrive in several different types of soils and pH levels. However, it has a preference for heavy or clay soil. 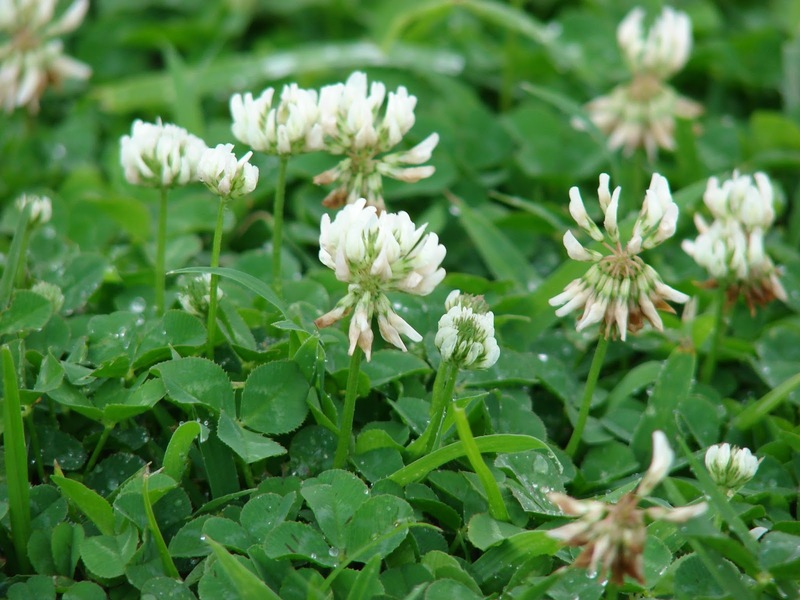 It is believed that white clover is a beneficial constituent of organic or neutral lawn care, as it possesses the aptitude to fix nitrogen as well as grows vigorously to prevail over other lawn weeds. It is worth mentioning here that natural nitrogen fixing is known to lessen leaching (trickling) from the soils. In addition, it also helps to prevent the occurrence of a number of lawn diseases, especially those that are increased due to use of synthetic or chemical fertilizers. White clover is native to nearly the entire Europe, Siberia, south-western Asia and the northern regions of Africa. Now, although it is also being claimed that white clover is native to the United States as well as Canada, this does not seem to be realistic. White clover thrives in a damp, circum-neutral soil having a proper drainage system. This species has a preference to grow in total sunlight and likes a sweet calcareous muddy or clay soil. However, white clover also grows well in poor or infertile soils. White clover is a vital food plant for caterpillars of several different butterfly as well as moth species. In addition, as the flowers of this species are loaded with honey, white clover is also an excellent bee plant and many beekeepers rely on this plant. When grown in a lawn, white clover is an excellent lawn plant and can endure close mowing as well as trampling, but loathes growing together with henbane or any other plant belonging to the buttercup family. It has been found that white clover plants grow excellently in an apple orchard. In fact, if the apple orchard has a ground cover of white clover, the fruits of the trees will be tastier and can be stored better. However, you should be careful not to grow this species together with gooseberries or camellias, as white clover hosts a mite that may cause the gooseberry fruits to drop prematurely and lead to early budding in camellias. White clover is polymorphic in nature, as it has several sub-species as well as different varieties. 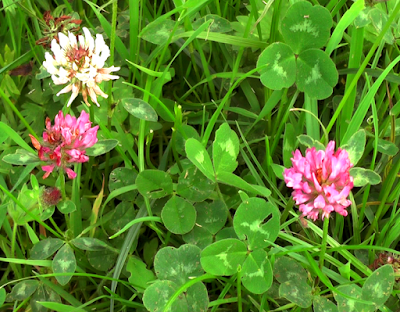 Often gardeners select from among a number of white clover varieties for using them in lawn mixes. White clover plants offer a number of health benefits too. The "Peterson Field Guide of Eastern/ Central Medicinal Plants and Herbs" states that the native Indians in North America used the leaves of this herb to prepare an herbal tea that was consumed to treat fevers, common colds, coughs and even leucorrhea. European folk medicine employed the flower of this herbaceous plant to prepare a tea that was used to treat conditions like gout and rheumatism. Similar to red clover and perhaps like most other clover species, white clover also encloses a natural chemical known as the estrogenic isoflavone genistein, which possesses several different types of activities, including preventing development of cancer and antioxidant actions. White clover has a number of culinary uses. The leaves, flower heads, seedpods and even the roots of the plant are consumed by humans, while it is an excellent fodder for livestock. The leaves of white clover are consumed raw or after cooking in the form of a potherb. The tender leaves of white clover are collected before they are in bloom and used in soups, salads and other items. In addition, the young leaves of white clover can also be used in the form of a leafy green vegetable, consumed after cooking in the same way as spinach. The dried out leaves of white clover pass on a vanilla flavour to cakes and other foods. The flowers as well as seedpods of white clover are dried out and pounded into a powder and used in the form of flour or peppered on cooked foods like boiled rice. They are both healthy as well as nourishing. The young blooms of white clover can also be employed in salads. The dehydrated flower heads are often used as an alternate for tea. While humans find it difficult to digest the flower heads and leaves raw, it is easy to overcome this problem - you may boil the plants for about 5 to 10 minutes after harvesting for easy digestion. You can dry out flower heads as well as the seedpods to produce a nutritious flour and also blend the powdered form with different other foods. Alternatively, you may infuse the flower heads in hot water to prepare a healthy and refreshing herbal tea. If you intend to use the young white clover leaves in soup, you should ideally harvest them before the plants come into bloom. The roots of white clover are also edible. However, usually they are cooked directly for consumption. For several centuries, people have used the white clover in the form of an additive in salads as well as other meals comprising leafy vegetables. In addition to being an outstanding grazing crop for farm animals, white clovers are also considered to be an important survival food for humans. White clover encloses elevated levels of proteins and is found extensively and in copious amount. White clover is known to cause certain adverse effects and, hence, it is advisable that you use it with caution. For instance, white clover is said to cause some troubles for grazing animals. These problems may be related to the climatic conditions where the plant is growing. White clover is a polymorphic species (having a number of varieties and sub-species) for cyanogenic glycosides. In fact, the leaves as well as the flowers of specific cyanogenic phenotypes enclose a type of glycosides that give off cyanide when they come in contact with an enzyme called linamarase.